In the distant recess of space a war goes on, huge mega corporations have found themselves locked in an endless war where they fight each other for valuable ore resources and territory I a three way battle between the Earth Industries Corporation and their loyal and dignified officers, the Mars Mining Operations and their lucrative ore mining businesses and the Venus Resources Unlimited who pride their technological advancement. However, the rivalry between these three Companies is not the biggest threat new pilots face, the hostile aliens that plague the various regions in which they operate are a threat to business, to each individual pilot and to humankind as a whole. 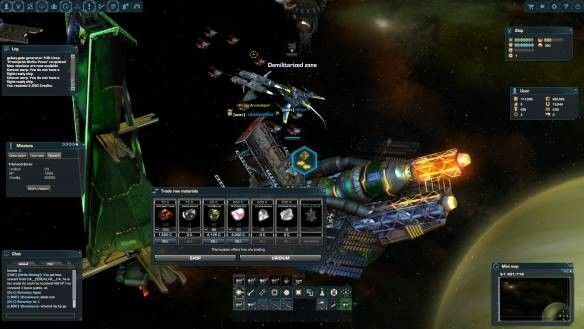 DarkOrbit Reloaded is a fast paced space shooter where players align themselves with one of the three main factions in the game as pilots for hire, flying their own space vessels they will take on various tasks and missions for their Company to fight off rivals and eradicate aliens. The game offers a variety of customization and personalization options, starting with the 11 different ships that are available to players, each of which can be outfitted with different weapons, armor, shields and more to suit each pilots on style of play. Furthermore players are able to customize their items and upgrade them even further through the numerous in game systems. Flying around the various maps that char out the near galaxy players will find themselves constantly swarmed by aggressive AI aliens that will quickly gang together and try to destroy them, only with quick actions and a ship load of ammo can players hope to take on the ever growing threat. Taking missions players are rewarded with XP to level up their character as well as Credits that go towards repairing and replenishing gear and purchasing various items for their ship. All around space players will find ore deposits that they can collect, depending on the ship they have will determine how big their cargo hold is and how much ore they can carry. Ore can be taken to the players Skylab, a refinery that will convert ore into useable material to trade and sell or use it to craft items, construct drones, robotic pets and powerful Tech Items; the Skylab is a feature that when accessed in game opens up a web browser tab for players to construct various items. As the game is a browser based MMO this also means that players can access their Skylab without logging into the game and simply using the player portal where they can check up on their creations. The game has a lot of PVE content including various PVE events such as the Invasion Gate which requires competing Companies to fight off enemy invaders coming through a gate in the middle of the map and earning points for doing so. Players can also engage in a variety of PVP games such as a class Team Deathmatch mode, Sector Control where players fight over territory, and a game wide Scoremageddon where every player in game has five lives and players earn points for killing them off!